The brown boxes that arrive on my doormat usually seem quite ordinary and non-descript to my neighbors and mail carrier — standard-issue parcel posts that shrewdly hide incredible treasures that lay dormant within. As I carefully use my matte knife to cut along the taped seams, my anticipation of the first look is only heightened. This is the secret ritual of a confirmed book addict. If the box happens to be from Japan (and in my case, it usually is), then I know that I will soon be holding an object that is not just a simple collection of photographs, but rather an expertly conceived tiny universe — one that is carefully considered and executed with design, image sequencing and the text to image relationship in perfect balance (or imbalance). I will catch a whiff of the slightly musty smell of an old book, acknowledge small traces of foxing and sunning, and most importantly, enjoy the “objectness” of the book as I remove it from its protective wrapping. This objectness makes the photobook the antithesis and antidote to the digital overload of my daily existence. This objectness asks to be touched, handled, and admired for its sequencing and design. This is the objectness that is nurtured in the amicable collision of a photographer and designer joining forces. And, this objectness is what sets photobooks apart from the small paperback novels that are now easily adapted to the Kindle and Nook. It is the tangible and the tactile that give the photobook its elevated status as an object to hold (and behold). In postwar Japanese photobooks, this objectness, with its highly attuned attention to every design, image and typographic detail, is the result of a well-regarded collaborative process between photographer and designer. During the 1960s, with the emergence of a distinctive Japanese visual style in design, theater, photography and film, collaborations with inventive designers such as Kohei Sugiura flourished. In both Martin Parr and Gerry Badger’s The Photobook: A History (Vol. I) and Ryuchi Kaneko and Ivan Vartanian’s Japanese Photobooks of the 1960s and ‘70s, significant space is allocated to discussions on the important role of the photographer / designer collaboration. Japan has and continues to be a print culture. Whether the famed woodcuts of the 18th/19th century or the current deluge of manga that has kids all over the world consuming books like candy, Japan has a rich history of the printed page. Despite a smart phone centric digital culture, Japan still values the tangible and physicality of the book — with contemporary Japanese photographers continuing to see the book as one of the primary vehicles for presenting their work. For Japanese photographers, a book is an entity that must have that “considered” balance of all its elements – one that achieves a “rightness” of design that is appropriate to a book’s concept (Parr and Badger 269). During the Provoke Era (late 1960s – ‘70s), many of Sugiura’s designs were responsible for creating this “rightness” as they simultaneously challenged previous notions of photography and the intrinsic nature of what constituted a book. Whether an image placement that pushed the boundaries of the page in a frenzy of movement or covers imbedded with silver discs, books designed by Sugiura are part of what makes touching, reading and looking at a Japanese photobook so special. Fortunately, the International Center of Photography Library has several strong examples of these seminal collaborations in its collection, which affords the opportunity for an in-depth view of all the elements that contribute to the unique objectness of the Japanese photobook. An early example of Japanese photobook experimentation in which “design meets photography meets text” on the highest level can be seen in Vivo group member Kikuji Kawada’s Chizu / The Map (1965, reprint 2005). Designed by Kohei Sugirua, Chizu is simultaneously a documentary and a multi-tiered conceptual object that takes the subject of the Hiroshima bombing and Japan’s complex relationship with the United States beyond a simple recounting of events. Packaged in a cardboard slipcase and interior foldout black wrapper inscribed with phrases related to the bombing, Sugiura’s design perfectly marries all the elements of the printed page with the Japanese tradition of package design. The cover image on the jacket shows a close-up shot of a flame with a typographic overlay of a poem. Within are gritty high contrast gravures on gate-folded full-bleed pages, which require the reader/viewer to peel away layers in a slow, deliberate process of discovery that reveals fragmentary views of the Hiroshima blast and American postwar “occupation” juxtaposed with abstracted close-ups. The overall visual sensation is visceral – merging the archival, scientific and emotional into an intricate portrayal of a historical event. Jun Morinaga’s Kawa, Ruiei / River: Its Shadow of Shadows (1978) is another brilliant example of Sugiura’s fine-tuned attention to the “rightness” of the photobook object. 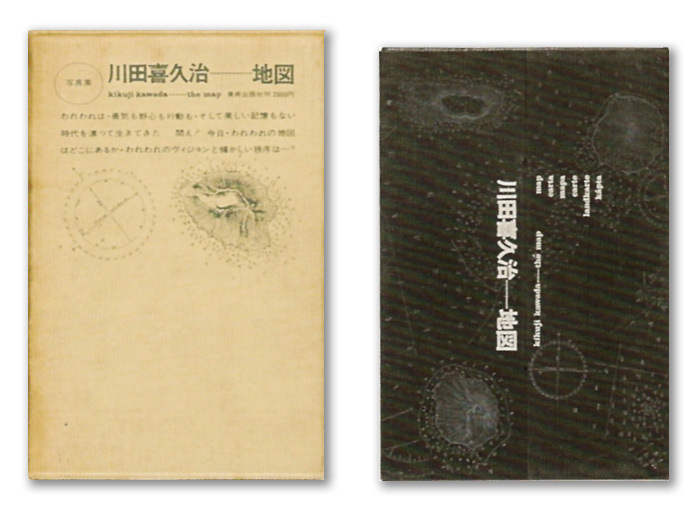 Again, through the use of gate-folded pages, Sugiura’s design purposely slows down the reader to give the book the contemplative focus necessary for Morinaga’s brooding images of the dark depths within Tokyo’s rivers from the early ‘60s. Rather than images of translucent light inflected waters, Morinaga’s water is muddy, intense and foreboding. Bits of surface debris and rotting garbage are framed close-up, as air bubbles take on an abstract patterning. As Kaneko and Vartanian point out in their text (220), River: Its Shadow of Shadows is important not only for its design, but for the support it received from its highly respected publisher Kazuhiko Motomura, who is also responsible for the publication of Robert Frank’s The Lines of My Hand (1972) and Flower Is (1987). Morinaga met Motomura through the American photographer W. Eugene Smith, who Morinaga had worked for as an assistant during the 1970s. Smith also wrote the preface to River: Its Shadow of Shadows. Martin Parr and Gerry Badger. The Photobook: A History, Volume I (2004), page 269. Ryuichi Kaneko and Ivan Vartanian. Japanese Photobooks of the 1960s and ‘70s (2009), pages 19, 88. This entry was posted in International, Unpacking the collection, Visual Research and tagged book design, Chizu, Japanese Photobooks, Jun Morinaga, Kikuji Kawada, Kohei Sugiura, River: Its Shadow of Shadows. Bookmark the permalink. Reblogged this on Wackjob's Ethology and Ethnology. Russet, a beautiful entry. I am curious about Sugiura’s involvement with Kawada’s, The Map. I have had the privilege of examining the original dummy, which is radically different from the final book. Do you know of the history of the formation of The Map from conception to print—and when Sugiura got involved? Ken: No, I don’t know the exact timeline for Sugiura’s start with Chizu. Will need to research further. Where did you see the dummy? What a privilege. Curious about the differences. I saw it almost two years ago, just a few blocks from ICP at the Wallach Division of Art, Prints and Photographs, rare book room of the New York Public Library by special appointment. Hand made with original prints, the dummy is in two volumes: one volume consisting of only the abstracted “surfaces” and the other volume more readable/recognizable as forms found in the world—a flag, objects, etc. The final book integrates the two motifs. One or two images are noticeably shifted and cropped in the final book. 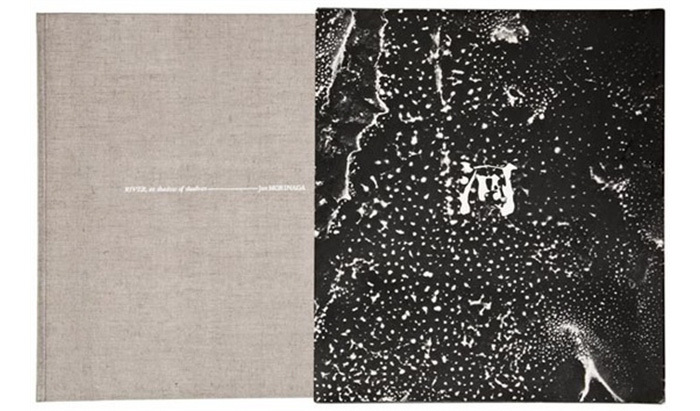 According to Kaneko/Vartanian’s entry in Japanese Photobooks of the 1960s and ’70s (p.86-88), Kawada originally made two sets of serialized magazine images: Chizu/Maps and Shimi/Stains. He later combined them in a 1961 exhibition at Fuji Film Photo Salon. His original intention was to create 2 volumes for his Chizu photobook: one for the A-Bomb Dome images and one for the war artifact images. The publisher Bijutsu Shuppansha felt the photos of the A-Bomb Dome walls would be too abstract as a separate volume and condensed the 2 volumes into one. “Designer Kohei Sugiura, while combining the two series, also gave the photobook a physicality that makes reading it a unique experience” (88). Still not an exact timeline for when Sugiura first became involved, but answers the issue of the two volume dummy you saw at the New York Public Library. That certainly adds some depth to the origin of the gem I saw in the NYPL collection. Thanks for your sleuthing, Russet.